Wild salmon inhabit a vast ecosystem that encompasses the rivers within and the ocean between coastal countries of the Pacific Rim. But within the past century and a half, many populations have declined in abundance and diversity; without the big picture, we haven’t been able to understand or quantify these losses in Pacific salmon populations. Until now. In Atlas of Pacific Salmon: The First Map-based Status Assessment of Salmon in the North Pacific author Xanthippe Augerot and colleagues use a common yardstick to measure distribution and risk of extinction for Pacific salmon at a consistent scale across the North Pacific. 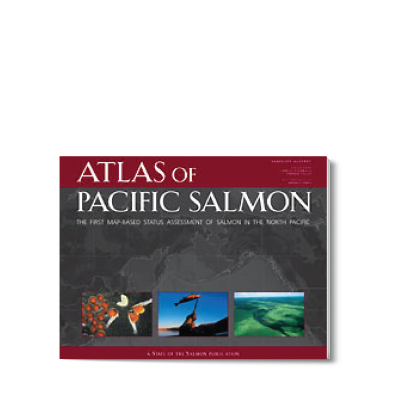 The Atlas, using more than four dozen maps, presents a never-before-seen, pan-Pacific perspective on the status of this genus.